Now what was it they would say in the ‘Cracker Jack’ commercial & theme song? Apparently they stopped putting the toys in the Cracker Jack boxes because parents were suing the company after their kids tried eating the boats and animals toys. 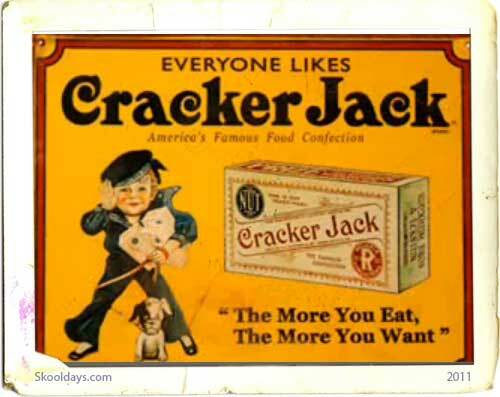 Anyone else remember the 1960s Cracker Jack Candy? This entry was posted in LunchBox, Pop Culture and tagged 1960, 1970 by Skooldays. Bookmark the permalink. I was lucky enough to meet the performer..who played the snack stand vendor..who sells the box of “Cracker Jacks”to those two little kids. I remember loving Cracker Jacks and trying to learn the words to the jingle as a kid. The peanuts were my favorite part of the snack. Of course the toy was the best! Until they started putting little paper joke books and the like for the prize.